I like dreaming up weird conspiracy theories for films, like they were made with the entire cast and crew at gunpoint, or the director was an alien. 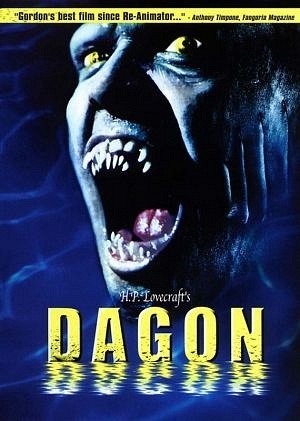 Quite a few films are secretly the result of two different films mashed together, or footage filmed and then abandoned being added to by a different crew years later; “Dagon” really seems to be a film that was started in Spanish, then they ran out of money and had to put a few Americans in it to get international funding. Paul (American) and Barbara (Spanish) are a couple on a rather nice yacht, holidaying with another couple. Barbara is one of those free spirits who seems fun when you’re a teenager but a heck of a lot of work when you’re in your late 30s; after seesawing between happiness and bitter anger a few times, she throws his laptop into the ocean because he shouldn’t be checking how much money he’s got, he should be enjoying life. Seriously? How do you think you ended up on that boat? Do you think they just hand out yachts to vaguely attractive women and their pasty white boyfriends? Actually, how the hell did the two of you end up together? Paul’s been having dreams about a large undersea structure, a giant eye-shaped thing, and a beautiful woman with odd features – when she opens her mouth, she’s either got multiple rows of razor-sharp teeth or tentacles emerging from it. He’s not got tons of time to ponder the most recent dream because the yacht is shipwrecked in a storm, luckily a short dinghy ride from a small Spanish fishing village. My first thought was “if any tourism developers had seen this village, it’d be covered with hotels” but luckily for the film, it’s thoroughly dilapidated and there’s only one. Paul and Barbara make their way to the village and start encountering the locals, who all look mysteriously pale and are covering their faces. They get split up, then Paul goes back to the yacht and finds his friends have disappeared, then things really start going strange. It’s a rare criticism to make, but this film moves too quickly. There’s no time to think “hey, this village is a bit creepy” before everyone starts losing their minds and attacking Paul, and while there are some decent little set-pieces, his chase feels weird to watch because they’ve not bothered to establish why everyone wants to chase him. Besides, you’d think with their Lovecraftian activities that they’d kind of want to not draw attention to themselves, rather than skin and slaughter anyone who wanders along (perhaps an okay idea when the story was written, but in the days of radios and GPS, not so much). Saying that, the discovery of the “tannery” is a genuinely creepy moment, and well done. I think HP Lovecraft has been treated pretty badly by filmed adaptations of his work. That this is regarded as one of the best ones tells you all you should need to know, from the old Spanish actor with the thickest, most incomprehensible accent I’ve ever heard English spoken in, to the horribly annoying main characters. What it does have is a strong main story. Paul literally meets the woman of his dreams, and he discovers the history of the little village he’s found himself in. Also, a lot of other adaptations of his work just assume his “Elder Gods” are Satan, and make it a black magic thing, when in reality his fiction was about creatures which long predated humanity and any ideas of God or the Devil. A new word was coined during this movie – “bloil”. It’s that mix of blood and oil you get in horror films, and is used liberally in this one. Booting a fish-human-monster hybrid where the sun don’t shine is now “kicking him in the caviar”…that my friends and I had time to dream up a bunch of new words and phrases may give you some indication of how good this film was. They had the atmosphere nailed, but the film itself was a weirdly paced confusingly acted mess. PS. Fans of one of the greatest computer games of all time, “Resident Evil 4”, may notice a few similarities between that game and this film – okay, it’s more “ganados” and less fish-men, but the vibe is there. I think it’s safe to say the game developers saw this film before they made theirs. This entry was posted in Reviews and tagged HP Lovecraft. Bookmark the permalink.